Jo-Anna from A Pretty Life in the Suburbs is stopping by to share her kitchen must-haves for whipping up delicious recipes. 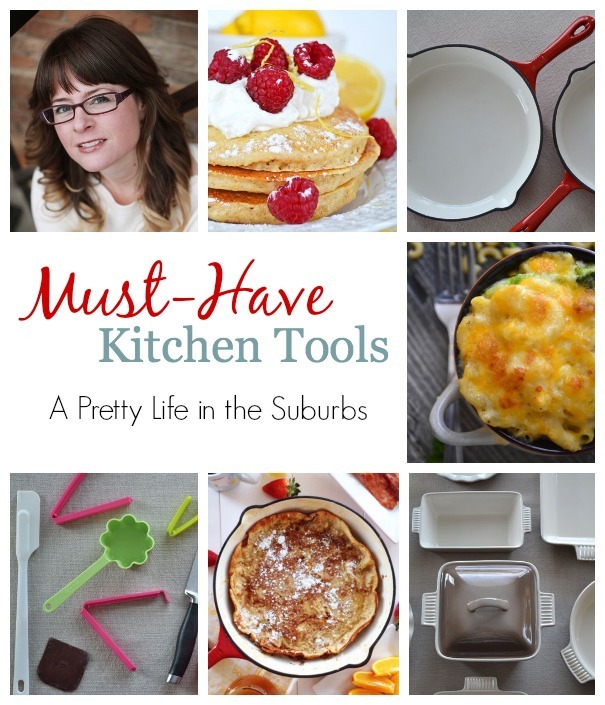 Well it wouldn’t be my favourite kitchen items list without my favourite cookbooks! 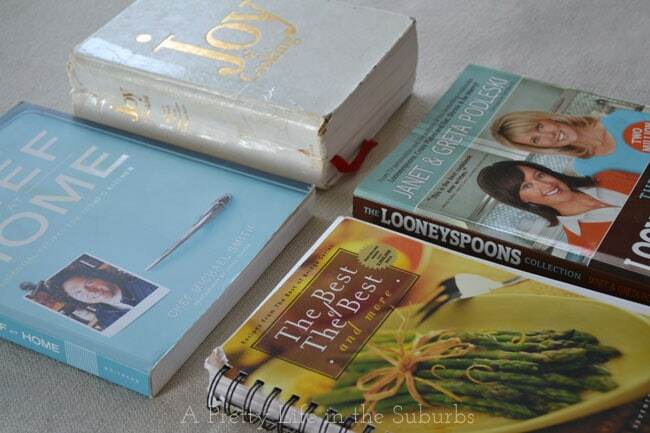 These four books are my most-loved cookbooks of all time: The Joy of Cooking, any Best of Bridge book, Looneyspoons and Chef at Home. I refer to them all the time and love them all! These are some of my most used kitchen items, and I would be lost without them. I use my Pampered Chef knife every day, it’s really the best! And the bag clips, these are the greatest invention ever! 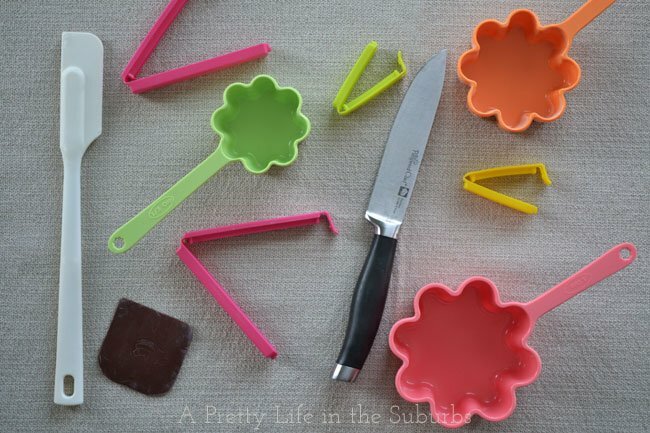 I also can’t live without my pan scraper, silicone spatula and my pretty measuring cups! These dishes are a recent addition to my kitchen and I love them SO much. I bought the entire set of this ceramic bake ware from Superstore. They bake everything beautifully, and they look fabulous in my blog food photos! I use these dishes everyday…they make an everyday meal look gorgeous! 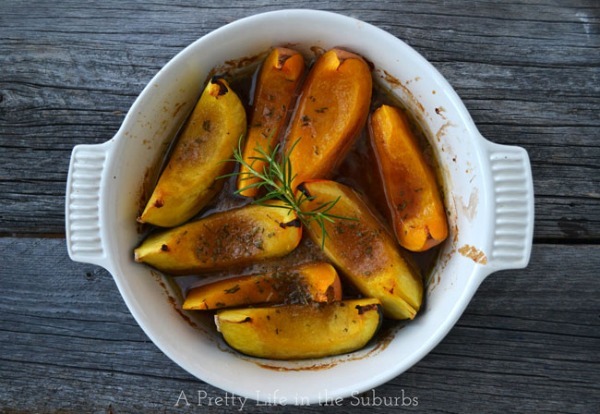 My favourite way to use these dishes is to roast vegetables, like this butternut squash. I absolutely love my heavy skillets. I grill, saute, broil and bake with them…but what I love the most about them is that I can start a dish off on the stove and transfer it directly to the oven…it saves time and dirty dishes! 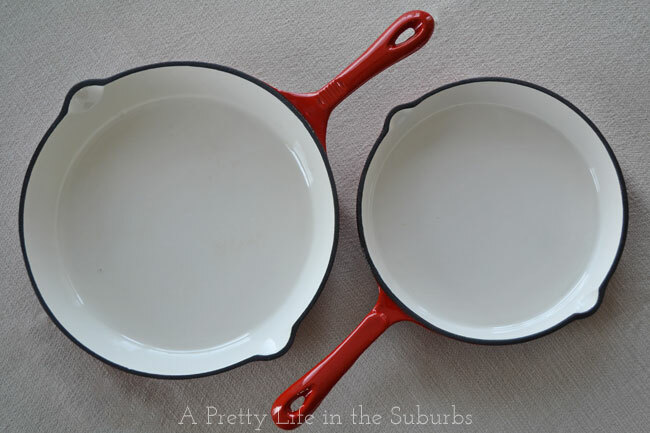 I used these dishes recently for my Apple Baked Dutch Baby. You can see more of my favourite things in this post! What can’t you live without in the kitchen? Do you and Jo-Anna share any of the same favourites? OMG! Have just discovered your blog and I think it’s so beautiful and fun to read! You are so creative and inspiring! Jo-Anna’s food does look delicious! I also love my heavy skillets and have the best chef’s knife from Home Hardware that I use everyday. Yes, that’s what I use my ice cream scoop for too. Works so great! I can’t live without my Kitchen Aide or food processor. Makes everything so much easier. I love all of your cook ware!! So gorgeous. I definitely think, as silly as it sounds, that an apple slicer is a key component to any starter kitchen. I juice a lot and cutting the apples, surprisingly, takes a long time. Having the apple slicer not only makes it easier, but also encourages me to eat more apples!! You are right your ceramic dishes do look gorgeous in your photos. My go to items have to be a good set of knives that I bought several years ago, my Calphalon cookwear and my rubber spatulas. My husband does most of the cooking in our house, I am sure he could add to the list. Hi, my first visit here. I see some of my favorite Pampered Chef items in your photo. Don’t know what I’d do without my PC gadgets! I’ve seen Jo-Anna and her delicious recipes around on Google+. I’m pretty sure I’ve pinned more than a few of her recipes. 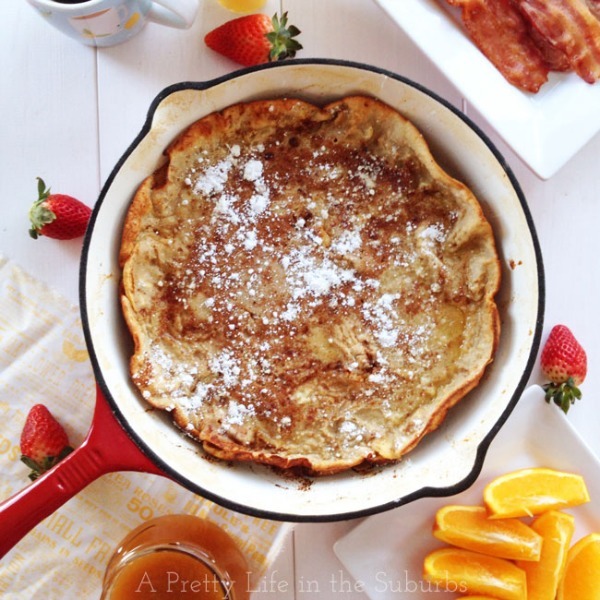 Love those measuring cups and the Apple Baked Dutch Baby looks delicious! I love the look of your blog! So clean and fresh! Those kitchen must-haves are great, but I have yet to own a ceramic set. What a great idea for a series! 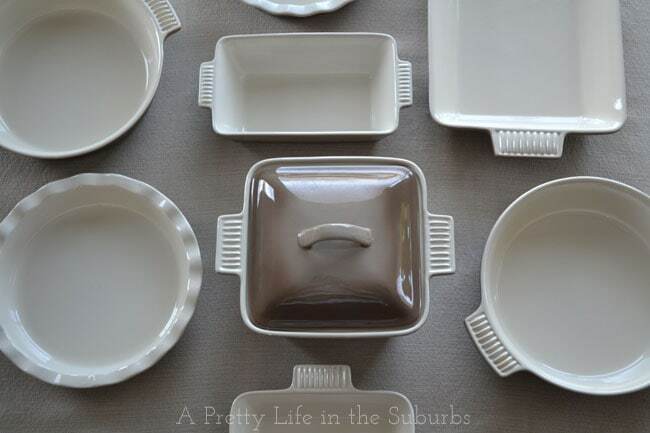 Those bake ware dishes are so nice…I love white dishes! Thank you again so much for the feature Shauna!! I need a late night snack after reading this. ;) Loving those fun measuring cups. I’m in need of a new set and now will be searching for some fun ones. I REALLY need heavy skillets!!! I’m adding that to my birthday wishlist! I just recently got a cast iron skillet and pot. I LOVE them! As far as my kitchen goes, I can’t live without my cute measuring set, my food processor and my crockpot. Oh my gosh, I love my crockpot. It saves this busy momma a lot of time!! Kitchen stuff = drool! Thanks for sharing your picks… love the cast enamel, hoping to one day make that investment!